Donna and Sean awoke to a stunner of a day in February. 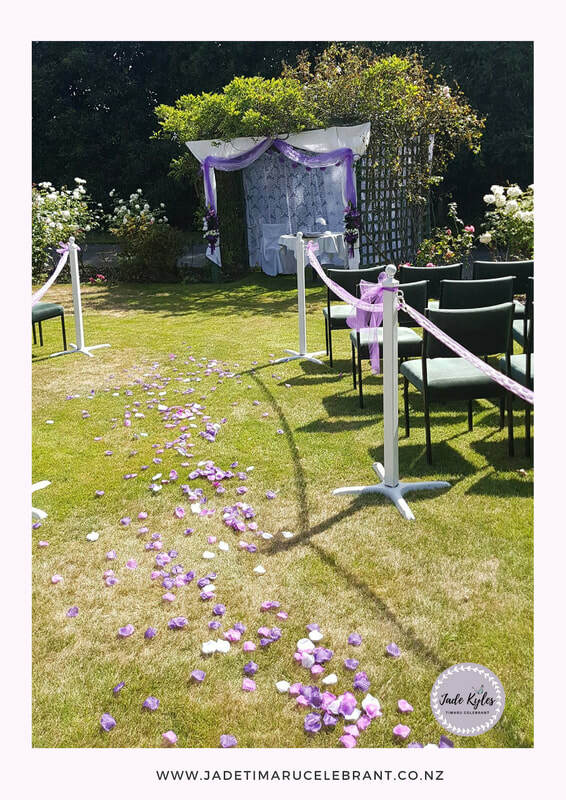 They created a magical ceremonial space at Seven Oakes in their gardens. 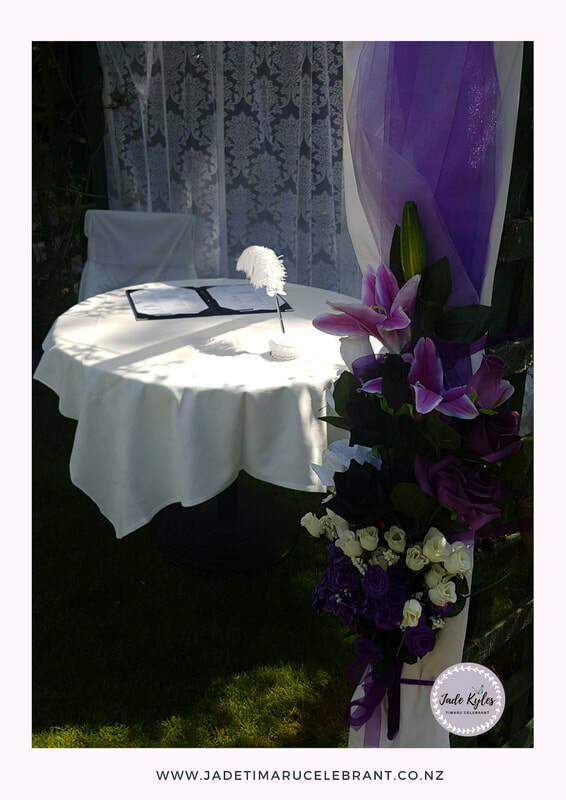 Donna's favourite colour is purple so varying shades of purple were used in the bridal part and the decorations. Family is important to both Donna and Sean so they made sure their wedding was going to have all their nearest and dearest involved. 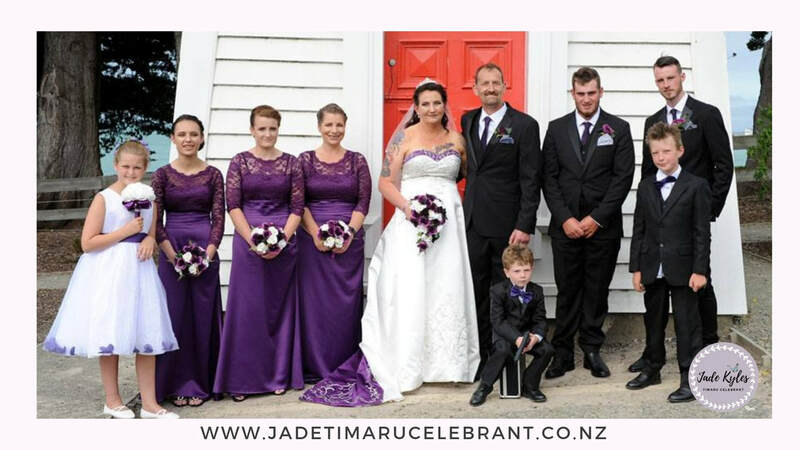 Guests travelled from overseas and all around New Zealand to celebrate with them. The wedding party entrance was amazing. Their youngest son had the very important job of being in charge of their rings guarded by his big brother. 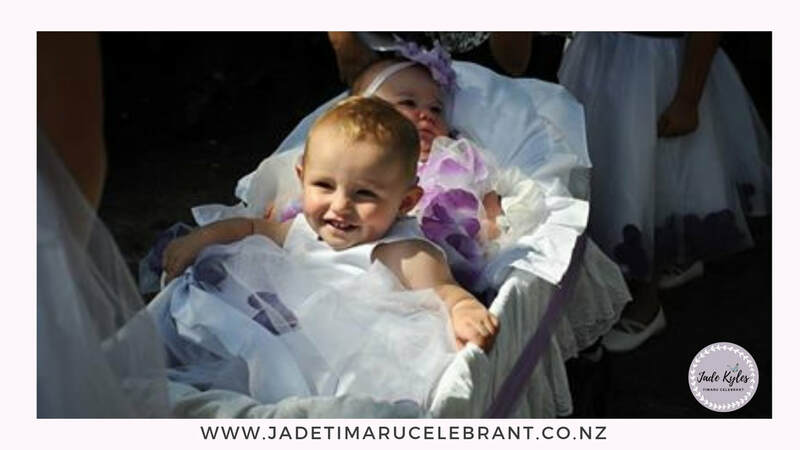 He was followed by the cute- as -a button flower girls and junior bridesmaids pulling two gorgeous babies in a carriage. 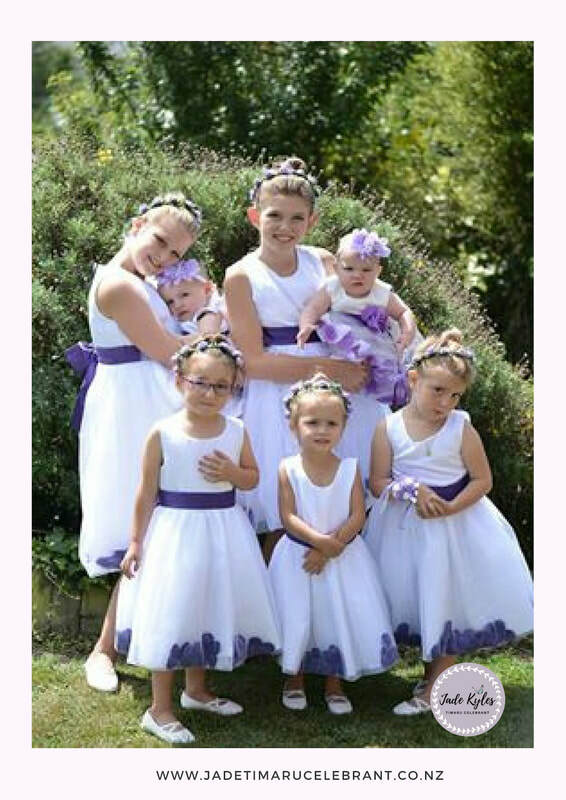 ​The bridesmaids followed with Donna being walked down the aisle with her son. They had a bespoke ceremony that included a candle lighting to remember those that were with them, solely in Spirit. There was laughter, tears and beautifully written vows. Their whole ceremony made everyone feel part of it, including the guests. Donna is very creative and had so many interesting decorations and unique everywhere. I really could feel the love and support for Donna and Sean from everyone there. They had their reception inside and I heard they celebrated into the wee hours. Congratulations Mr and Mrs Wickenden. Ready to create your own love story? 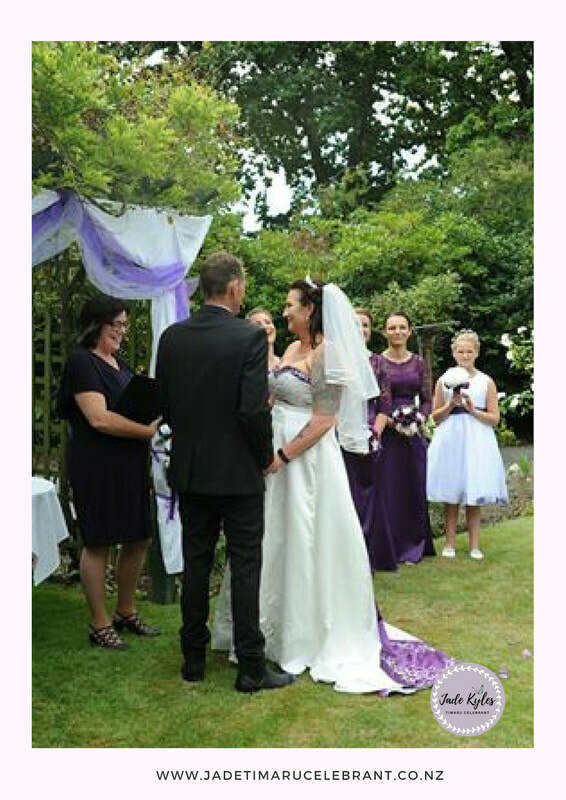 ​Let's connect and see if I am the right wedding celebrant for you! ​We will have a chat for 20 minutes and discuss what you want and need. If you don't know what type of wedding ceremony you want - not a problem, I am full of good ideas! 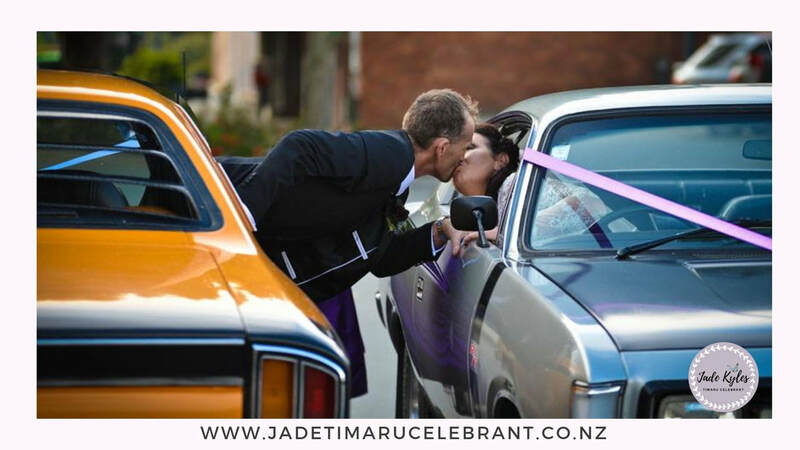 ​and Civil Union Celebrant in New Zealand.